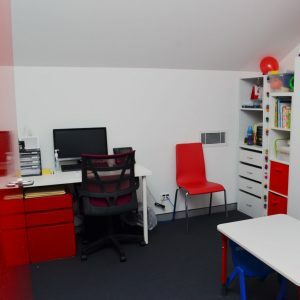 After trialling different houses in the Inner West, Therapies for Kids (TFK) has finally found its “forever home” in our beautiful new “shed” in Leichhardt. It sounds simple, but walk through the door and a whole therapeutic world emerges over 3 levels. For those who need help to access the different levels we have our eccentric elevator just inside the door. Then it’s decision time – down for Physio or up (for the more “serious” therapies) for Occupational Therapy (OT) and Speech Pathology (SP). Check in and our delightful reception staff led by Tarryn will direct you. 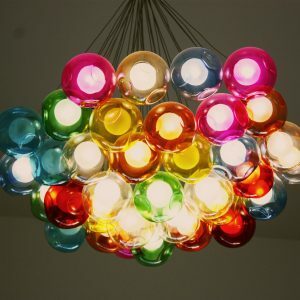 Heading up the stairs under Deb’s wonderful rainbow chandelier and along the corridor are the rainbow doors leading into our colourful OT & SP rooms. The OT & SP team is led by Jane (OT) who has been at TFK for over 6 years and who provides both extensive knowledge, experience and calm leadership to Tyler, Pauline & Bronte. 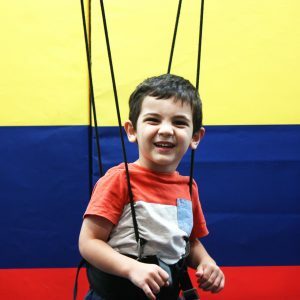 These rooms have been equipped with an impressive array of games, therapy tools and assessments to allow us to provide excellent therapy to all children. In addition, the custom made furniture can be adapted to provide optimal postural support while children are working, (and just for fun everything is colour matched). All therapists have a computer and tablet with games, apps and programmes to support the child’s learning style in school & home. Walking down the corridor past the rainbow doors we arrive at the dual use kitchen/boardroom. This has been designed for conferences, staff and client/family meetings (as well as a resource for occupational life skills training). The staff love the boardroom table and management are very happy with the kitchen clutter tucked away around a corner. In here there is a smart TV for student & staff training. With our increasing student presence this is becoming increasingly necessary. Deb presents a case study for professional development most weeks and through this we will be developing both this blog and her teaching units for the TFK method. 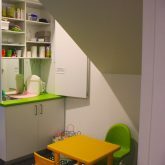 Moving on from the board room is a photocopy & resource storage area, then behind the teal door is our upstairs bathroom with full disability access and our small change table. The upstairs area of TFK is a quiet contrast to the noisy gym which allows for concentration when it’s needed. The therapists do leave doors open when modelling the need to concentrate within a more noisy environment & this dual use of the area works well. If needed, parents can watch sessions from the corridor through one-way glass and it is not unusual to walk up the stairs to find a parent peering through a window. 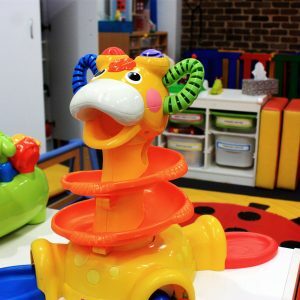 If you are heading down the stairs to the Physio gym, take moment to pause at the top of the stairs to take in Deb’s domain … a colourful children’s therapy room with just a hint of seriousness in the electric therapy to the right. 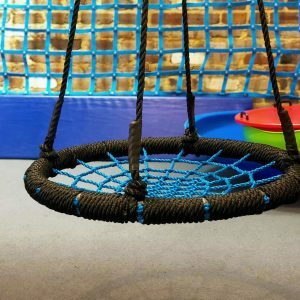 On this level we have our wonderful Universal Exercise Unit or “Spider Cage” for partial supported weight bearing that doubles as a sensory dark room for children who need decreased light for vision; for sensory children needing quiet place to concentrate or readjust and a wonderful sensory experience for any child in the gym. The Spider Cage also has monkey bars for upper limb work, pull-ups for strengthening and of course all the various “Spider Cords” for flying. Past the Spider Cage is our large harness area and treadmills. This is a well used area also for partial supported weight bearing, CME and treadmill training. The harness system is the only one of its kind in Australia which allows children to move freely in the harness – hands free anywhere within the 16 square metre footprint. This is also where we have our medical treadmill which allows us to start training our pre-walkers in dedicated walking training as well as post-botox and also walkers who need to start at a very low speed. In addition, this treadmill can accommodate uphill and downhill slopes as well as backwards walking. Beyond the treadmills on the left are our climbing frames, obstacle course and climbing ladders. This is a great place for practicing developing motor skills, motor planning and balance. Turn to your right to discover our 3 baby areas and the baby harness. 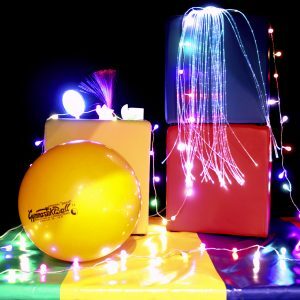 This area is highly stimulatory and enriched with sensory toys, light and sound toys, choice making & problem solving toys. The rainbow mat in the harness area is dual use with textures and a black & white side for the visually impaired. 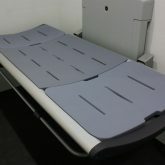 Most of the equipment here is made of foam to provide a safe environment for exploration by our early movers. 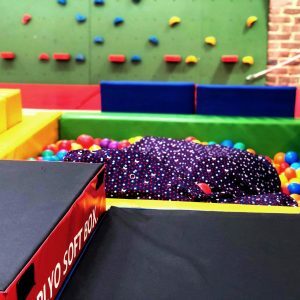 In front of this area is the soft play and ball pit area which is often the centre of the gym with much laughter and excitement as children explore and practice motor skills in another safe and fun play area. 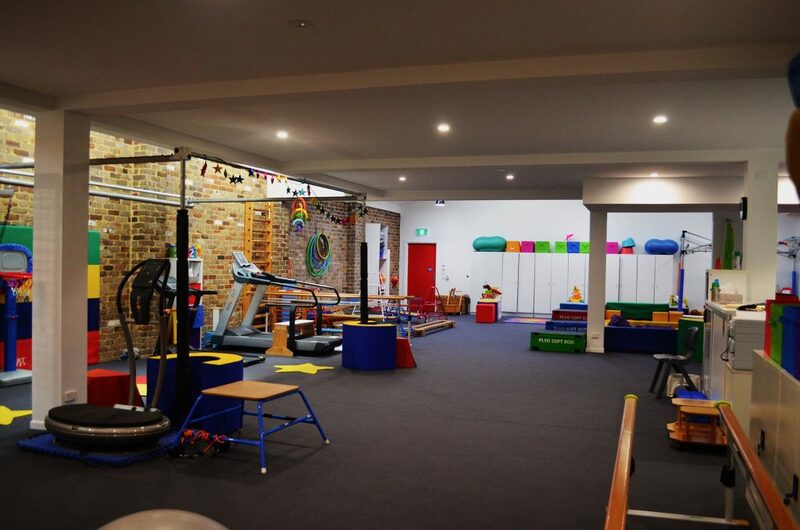 To the right of the soft play area is our renowned Climbing Wall, (TFK was the first therapy centre in Australia to install a climbing wall), which our staff lovingly repainted when we moved. We have positioned our Cargo Net next to the Climbing Wall to allow for motor planning in the transition from one to the other. Our huge red mats double as a safe landing mat for somersaults, hand stands & walking walls. Lots of muscles are developed by the therapists & students when shifting these around the gym. Our swing/sensory area leads into Deb’s & Kiri’s desks that allows them to see and hear whatever is happening in the gym and this provide support and knowledge whenever it’s required. The Physio staffroom is behind here and you will often find the therapists and students heads down writing reports or reading the current research as evidence based practice is very important to us at TFK. Along the wall of the therapist’s staffroom are the parallel bars, exercise bikes & our multiple ?? of musculoskeletal equipment & therapy table. This area provides a quiet space for assessment of posture, children with sports injuries and our tiny babies. On a Tuesday, this area is a hive of activity where Bronwyn provides her expertise and experience with plasters for any child who needs this treatment as part of their treatment plan. We find it particularly useful for toe walkers with tight calf muscles and for children with Cerebral Palsy (particularly post-box treatment). Kiri is Bronwyn’s second set of hands which allows parents the time & space to support and sometimes to distract the little people on the bed. We are nearing the end of our tour of TFK, on the left is our large bathroom with disability access and complete with an electric-lift adult capable change-table (which we are particularly proud of and which has already seen a lot of use). A small laundry in this room is often in use ensuring that we can keep clean any material objects used in the gym. At the very end of the gym tucked in next to the left is a small hidden kitchenette for staff & parents. It is a great area for a quick break for children involved in one of our Intensive Programs.